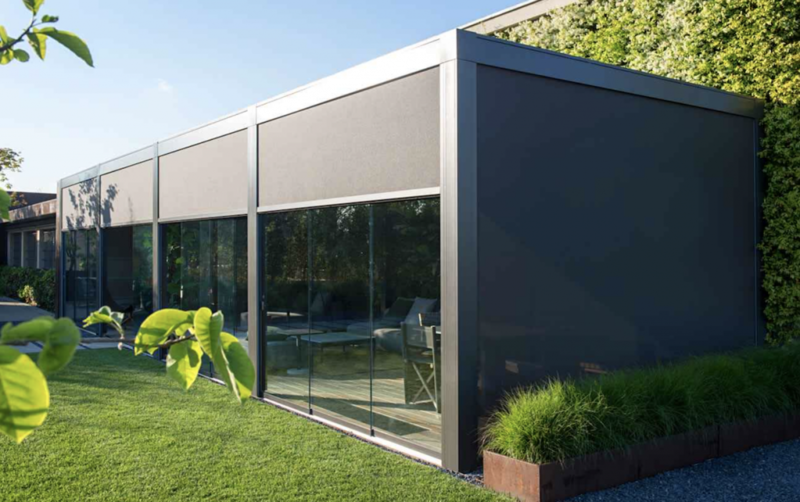 We offer a very professional design, supply and installation service of these relatively new systems to the UK market. 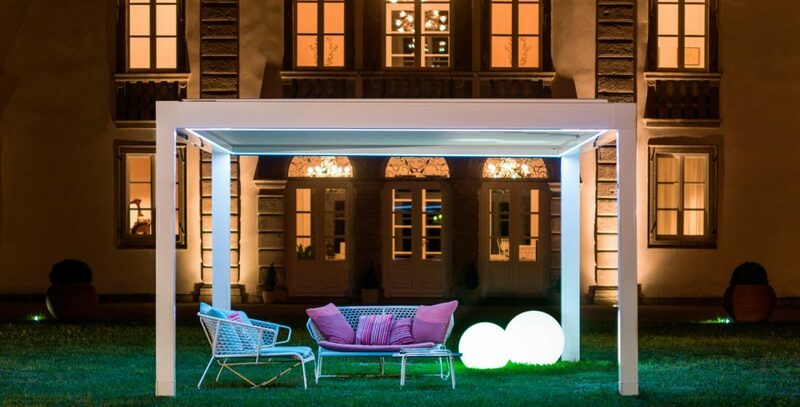 Including some of the most popular and best built pergola brands including Pratic, Gibus and Biossun in the UK. Enjoy the outdoors for more of the year and spend more time in your garden. 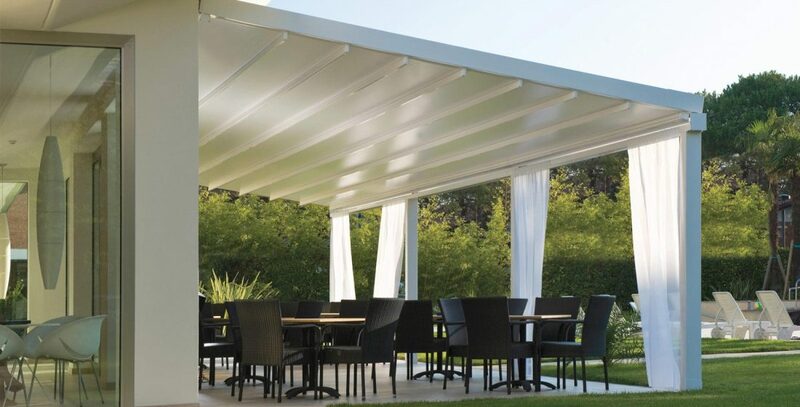 Suitable for residential gardens or commercial bars and restaurants. 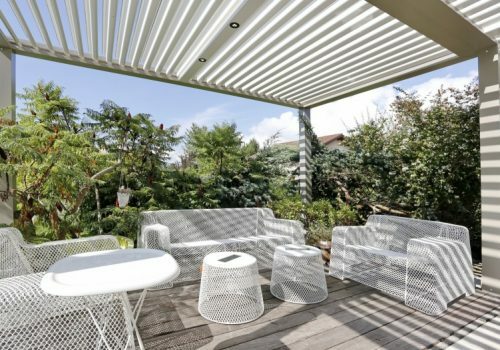 What types of Pergola are there? 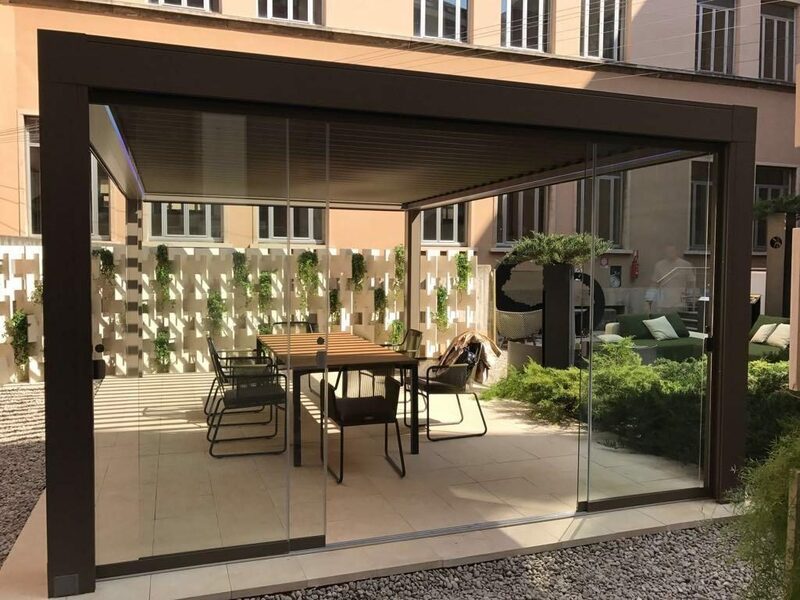 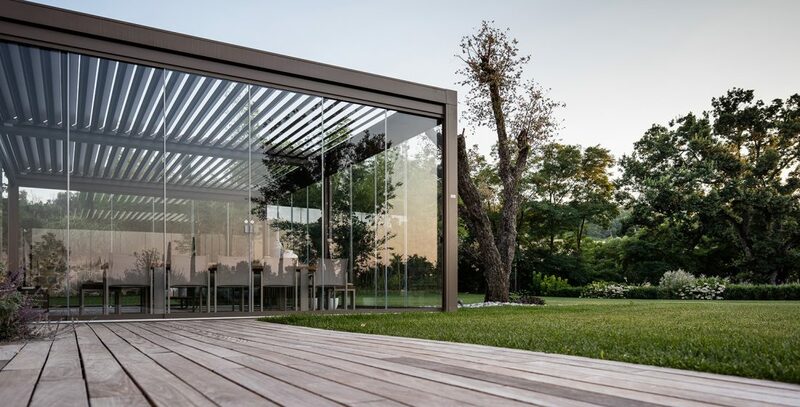 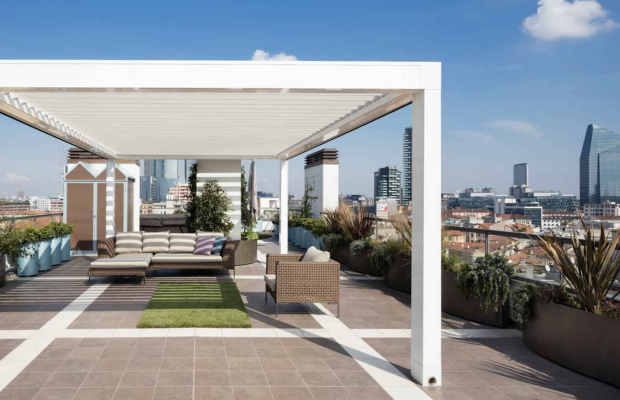 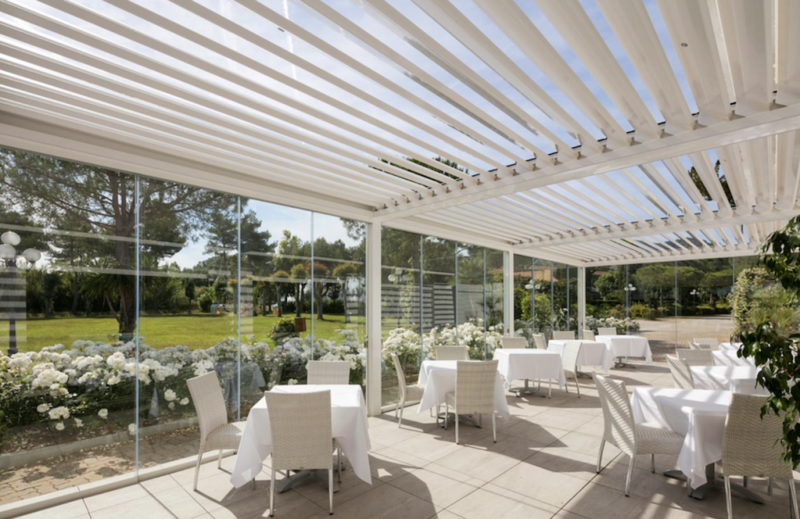 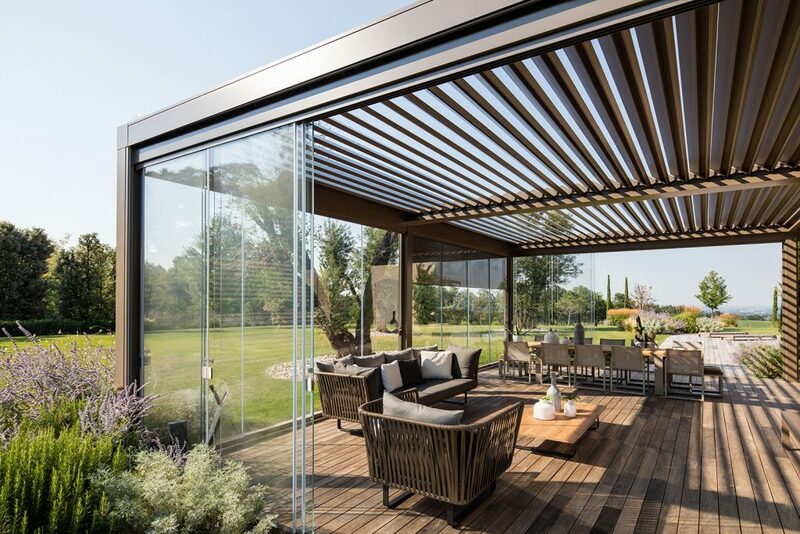 You can buy Pergolas with a retractable roof, which is operated at the push of a button to open when its hot and sunny and close to provide shelter when it rains. 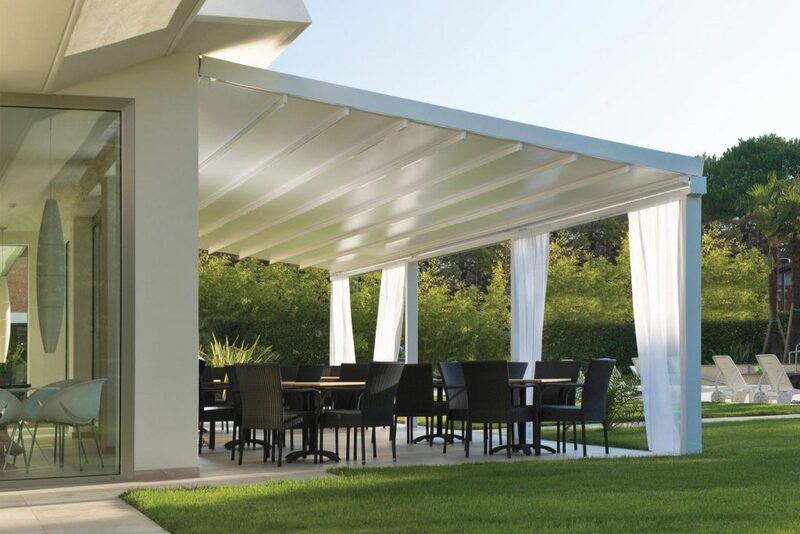 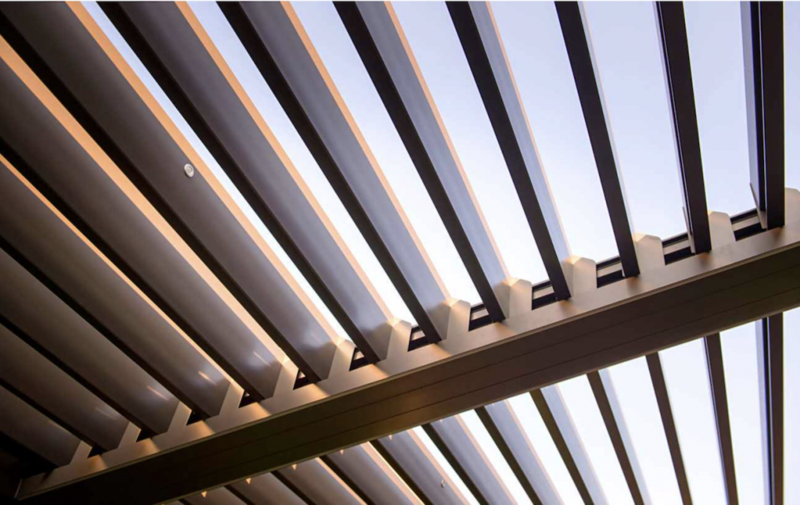 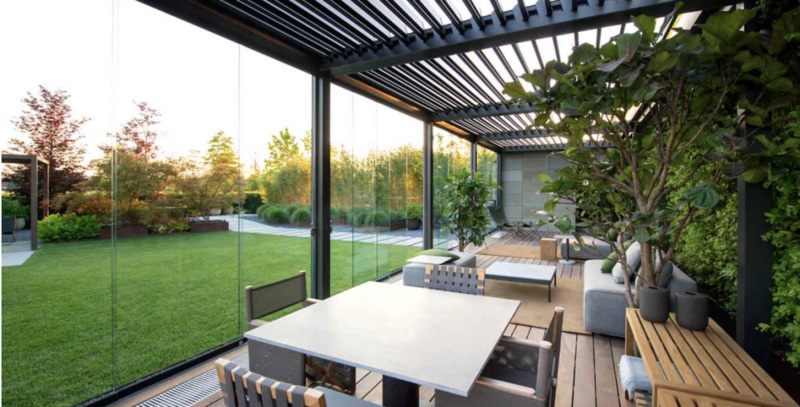 An alternative roof structure, which is becoming increasingly popular is the Bioclimatic Pergola with a blade system which opens and closes to provide a watertight seal. 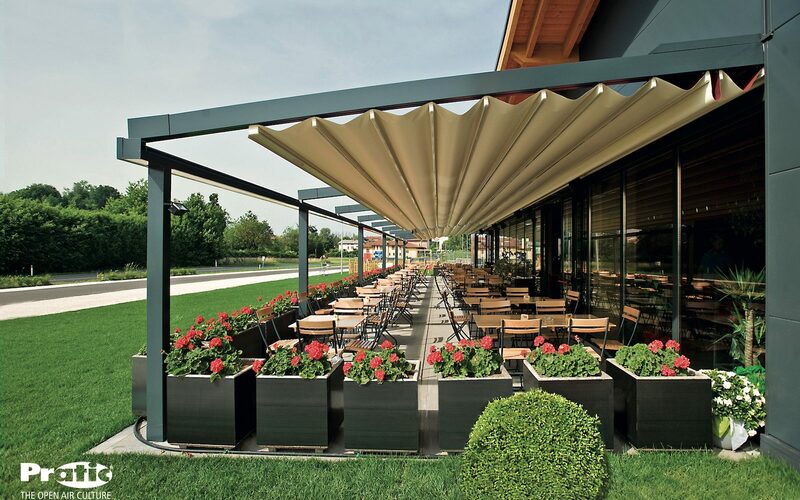 The pergolas have integrated gutters, effectively taking care of water run-off. 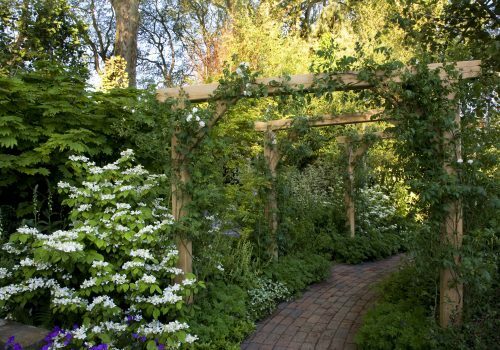 Water drainage runs along the top of the pergola and down the pergola posts. Both types of roof structure gives complete protection in sun, rain wind and snow. 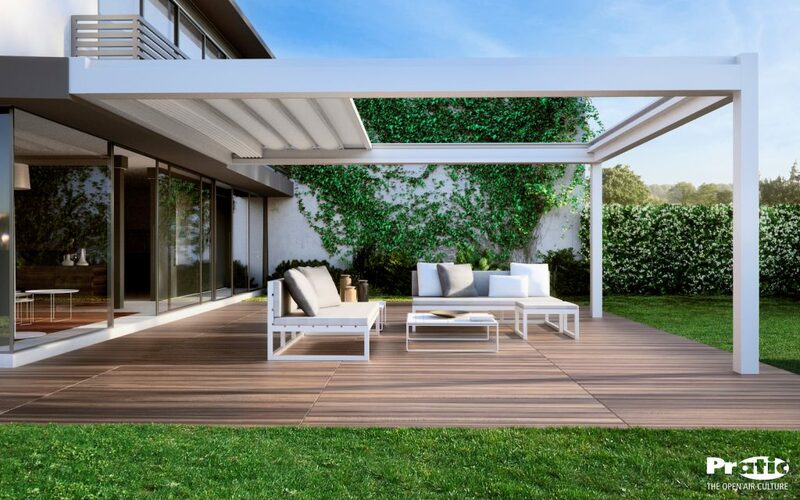 Then you can also choose to have a self-standing pergola, designed to stand isolated away from the main house or building. 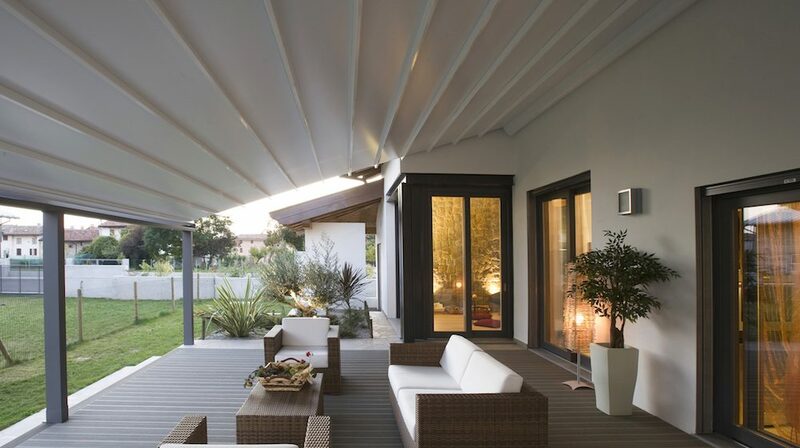 Or a lean-to structure which extends the amount of inside space, easily bolting to the wall of your house! 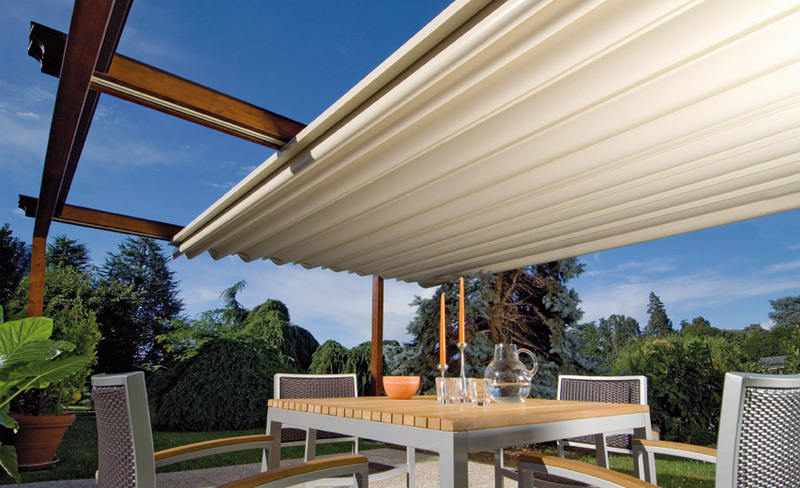 Ideally suited for the person who wishes to use their patio or terrace in inclement weather! 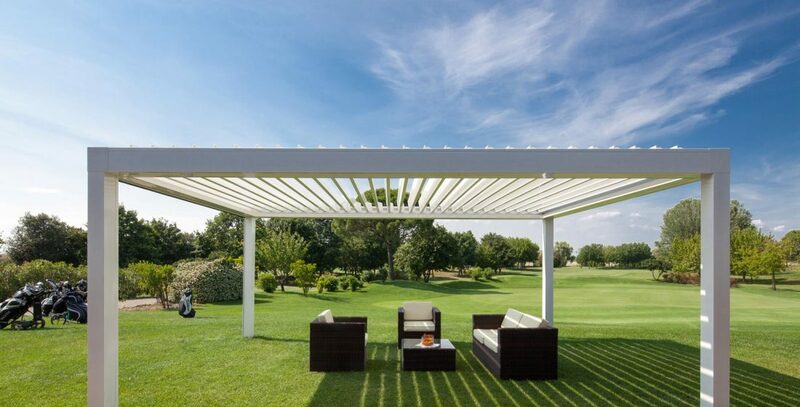 There are different styles of pergola too. 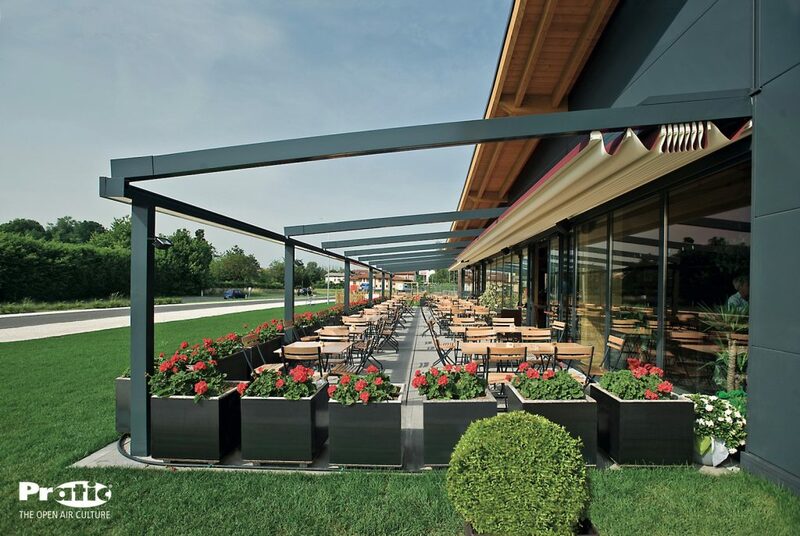 Contemporary Pergolas or Traditional Pergolas. 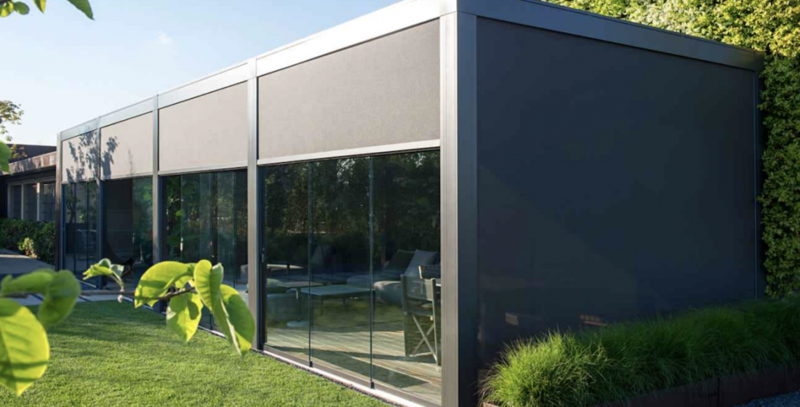 Contemporary, being more modern and sleek in its design is typically manufactured from aluminium and sometimes wood. 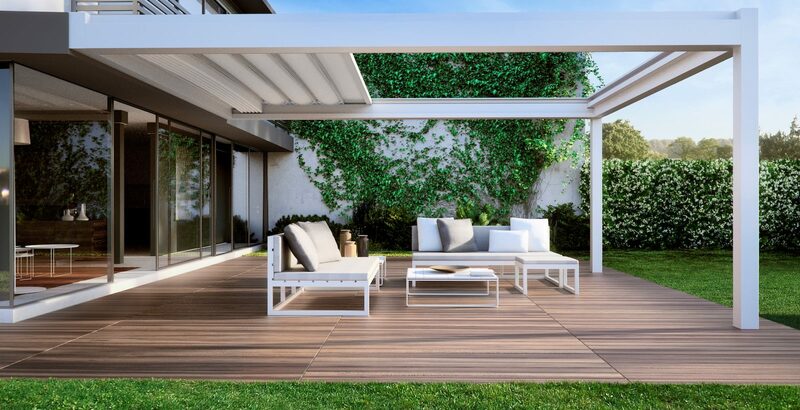 Traditional Pergolas are usually made from wood, such as Oak which gives it a mature and aged look. 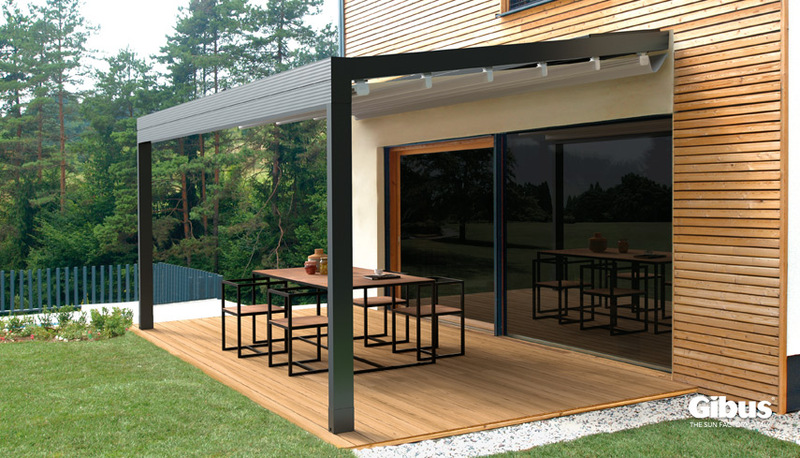 Pergolas are available in 7 standard frame colours including the popular corten steel and grey anthracite shades the awning will blend with any contemporary setting but special colours are available at request. 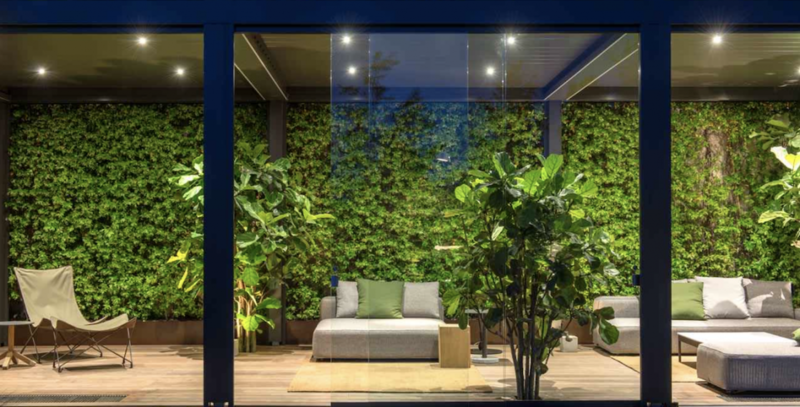 Lastly, select your options which are available including automatic climate control and integrated LED lighting with RGB colour lights and dimmer controls. 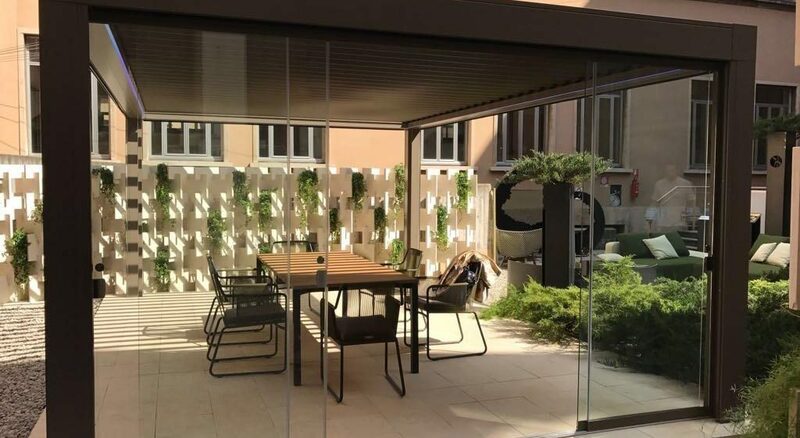 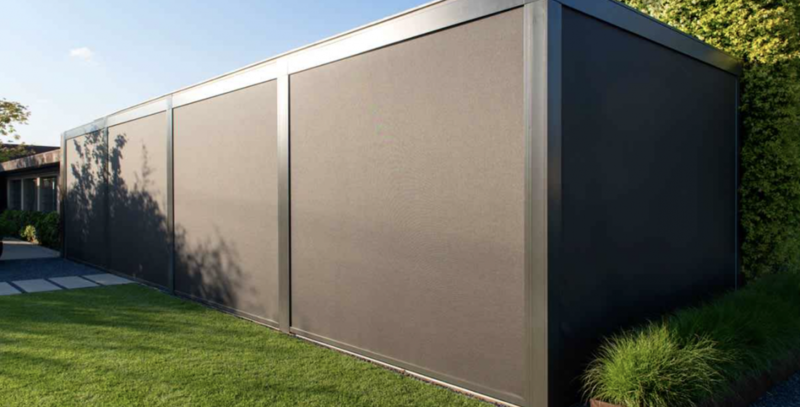 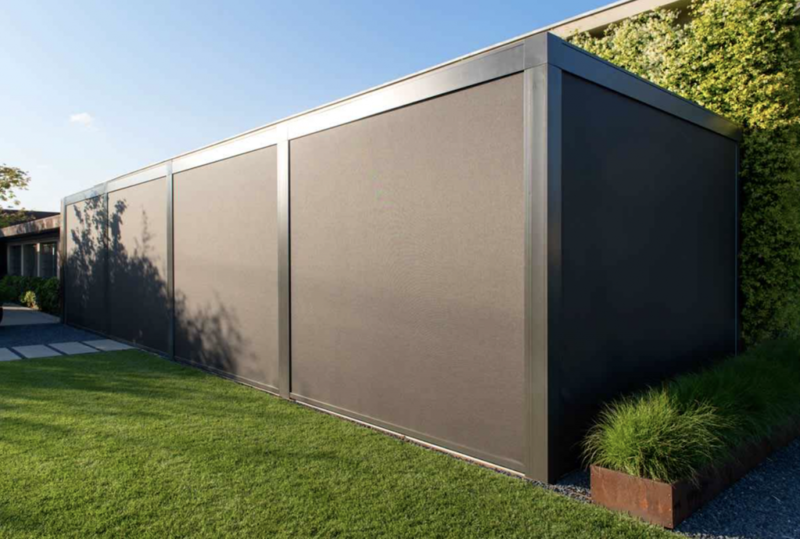 The Opera also has provision for integrated drop down side screens which retract completely into the frame work of the structure to keep that sun out of your eyes on a bright day or keep you extra cosy when the wind picks up. 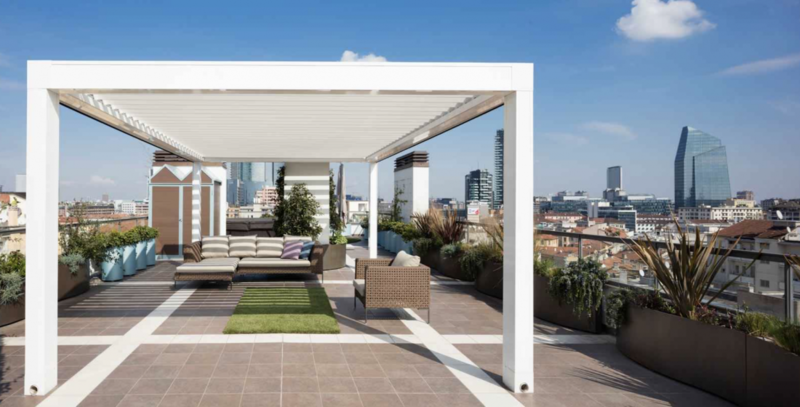 Rooftop Pergolas – enjoy the views in comfortable sheltered surroundings. 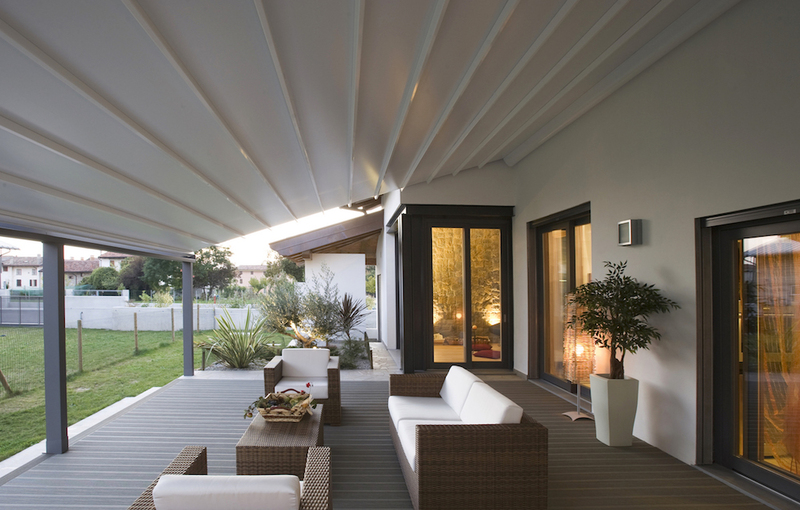 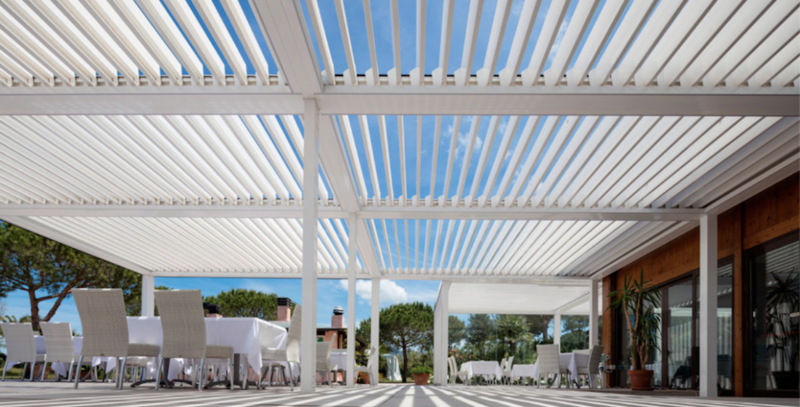 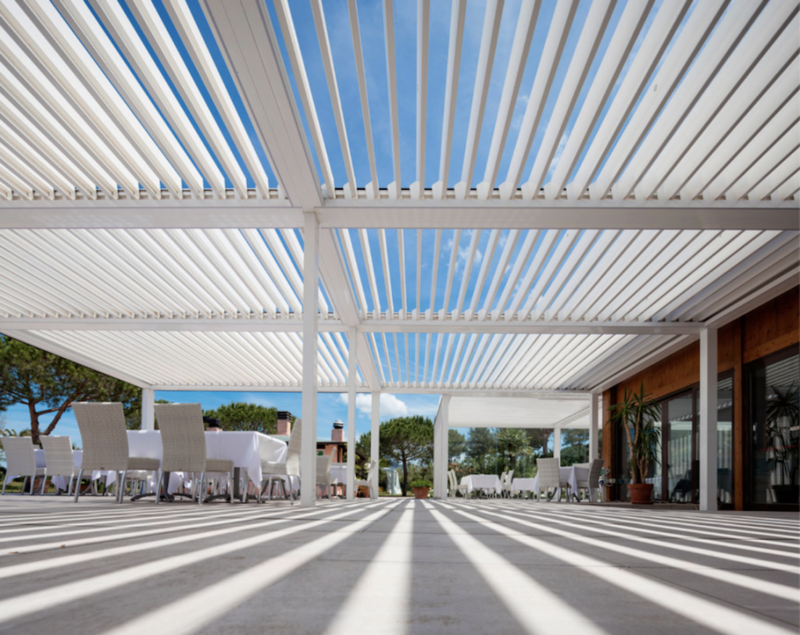 Bioclimatic Pergola made from aluminium in white, offering a retractable canopy at the press of a remote. 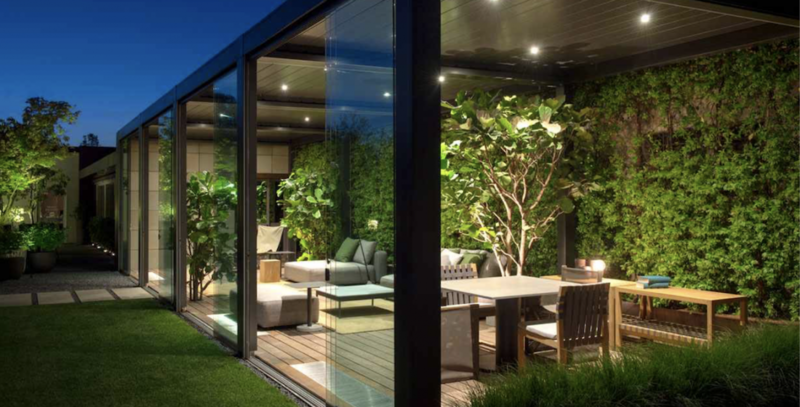 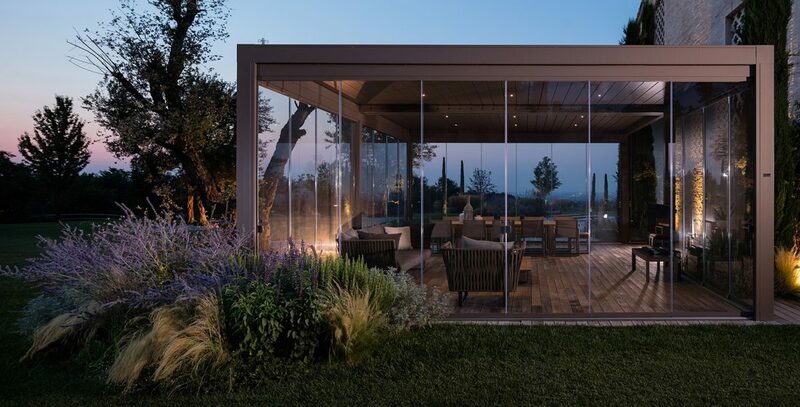 A stunningly modern Garden Room with Bi-fold Glass sliding doors in a corten steel finish. 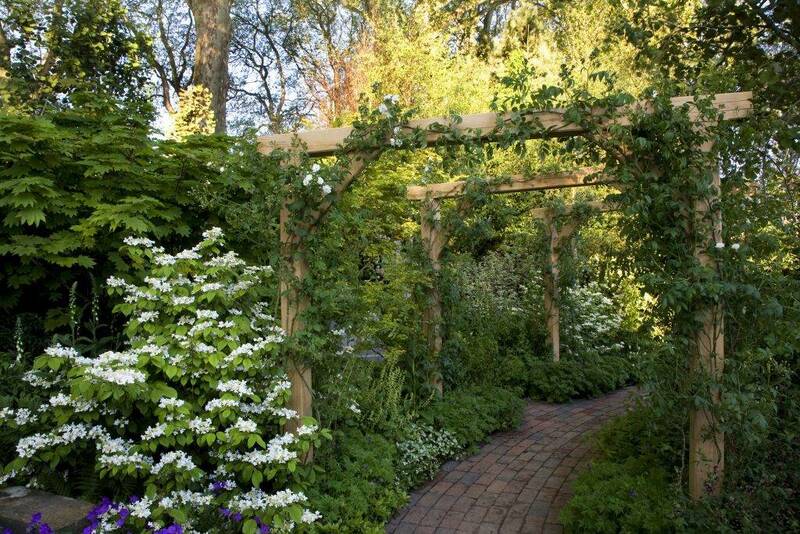 Ideal for creating peace and tranquility. 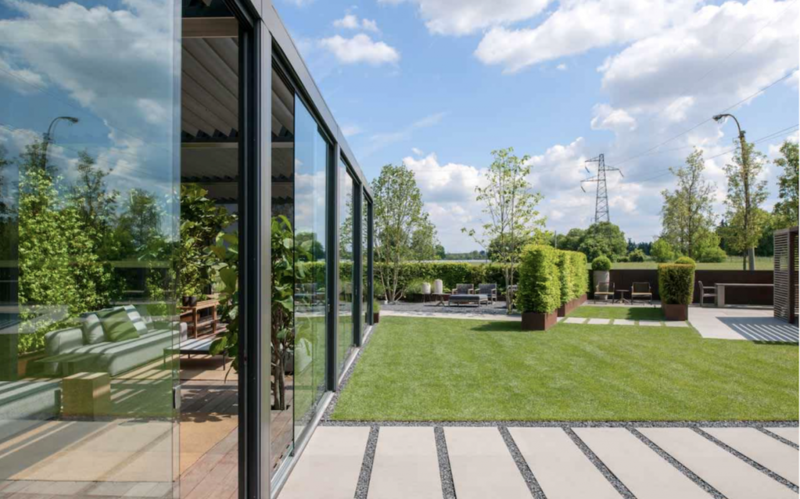 Enjoy the sunshine streaming through the top and sides of the building when its warm and sunny, then close the roof and the glass doors to create a sheltered, cosy environment when it rains. 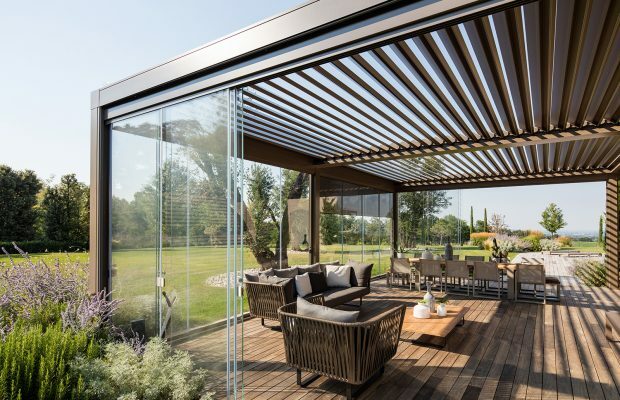 Home office, Alfresco Dining, Yoga Studio, Home Gymnasium – whatever the need, you’ll be sure to create an incredible atmosphere in one of these Pergolas. 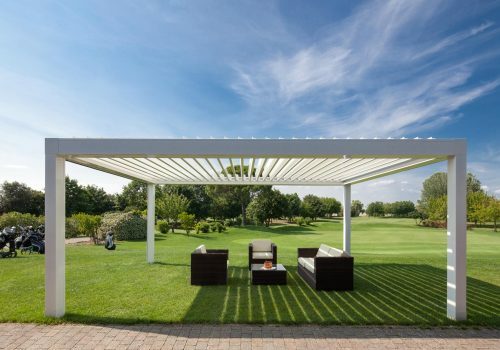 What are the benefits of a Pergola? 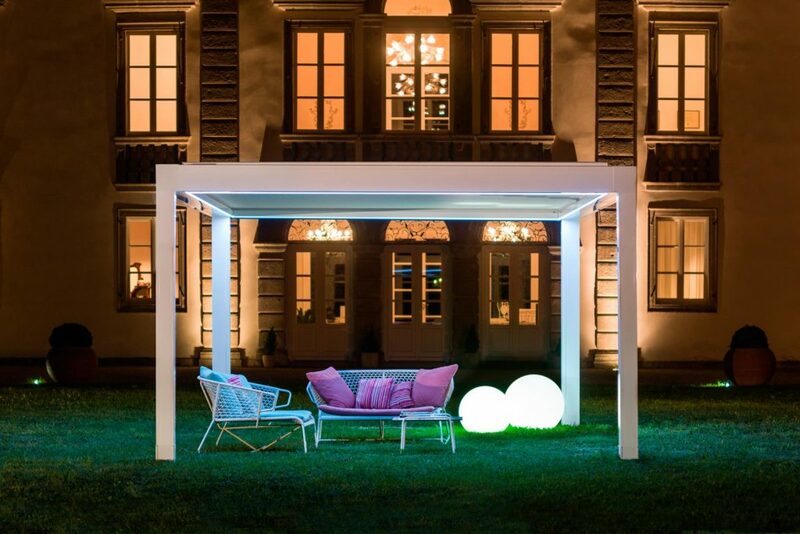 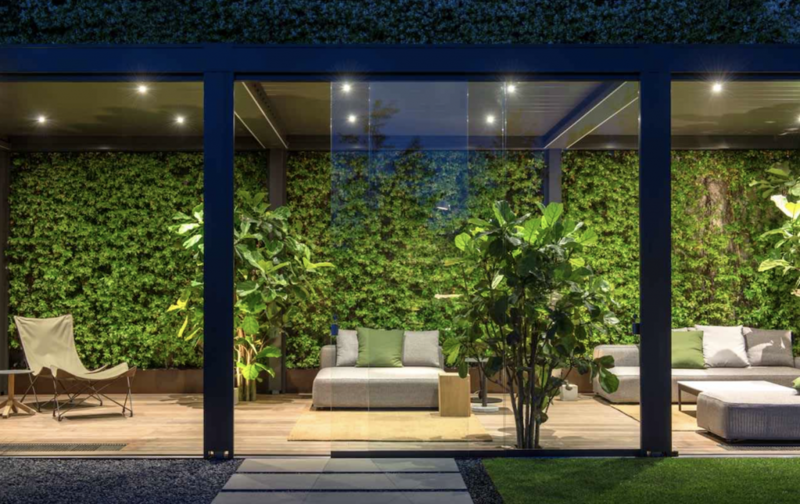 Instantly create indoor space outdoors, creating warmth and shelter. 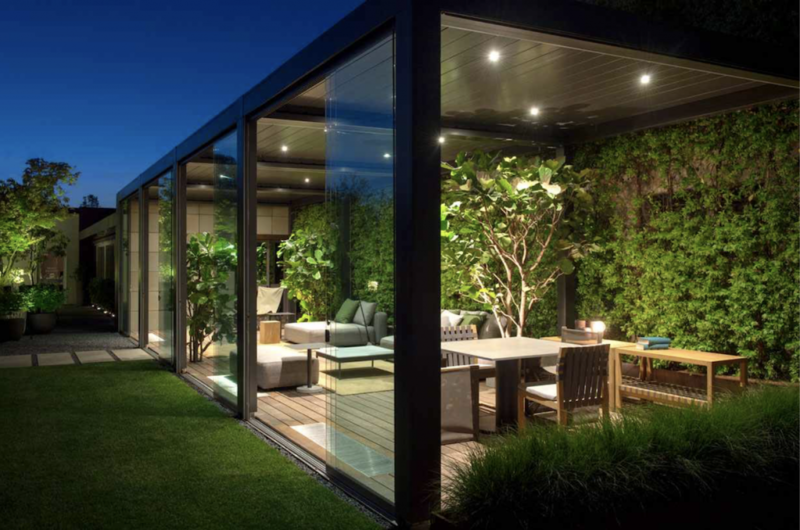 Being a temporary structure, planning permission isn’t normally necessary and if you move house you can take it with you! 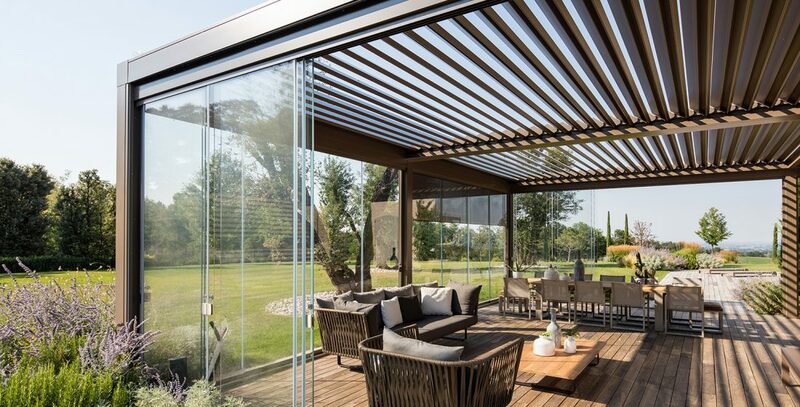 For those with a garden at home, Pergolas can create a cosy and sheltered space outside, ideal for lounging, al fresco dining or if you add glass bi-fold doors you can even turn it into a home office! 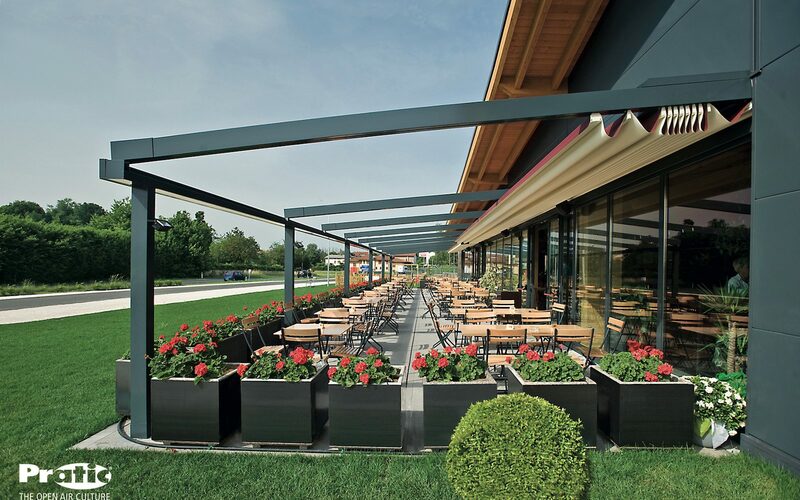 For clients in the hospitality sector, you can increase your capacity of people and tables by extending the amount of usable space. 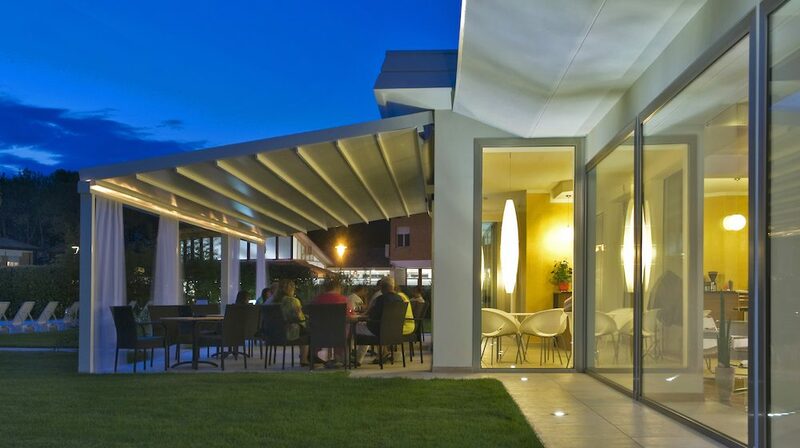 Pergolas offer a great return on your investment and your clientele will know you for your contemporary outdoor pergola! 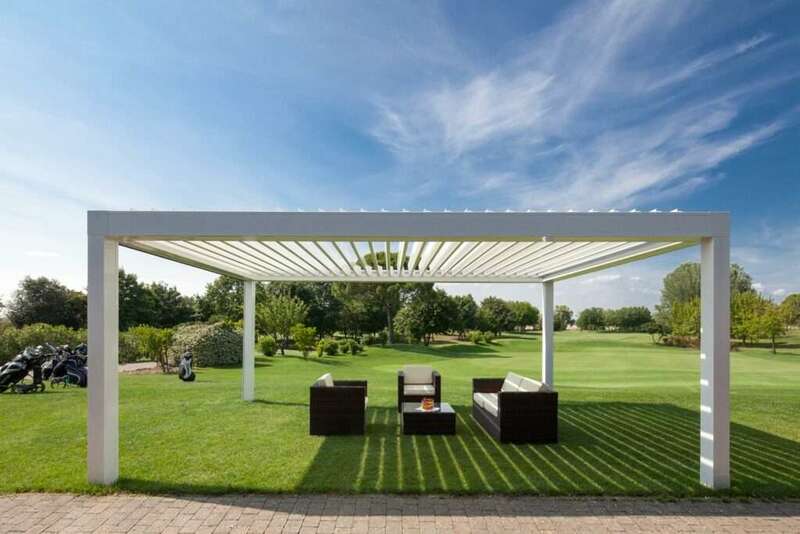 Pergolas are for anyone. 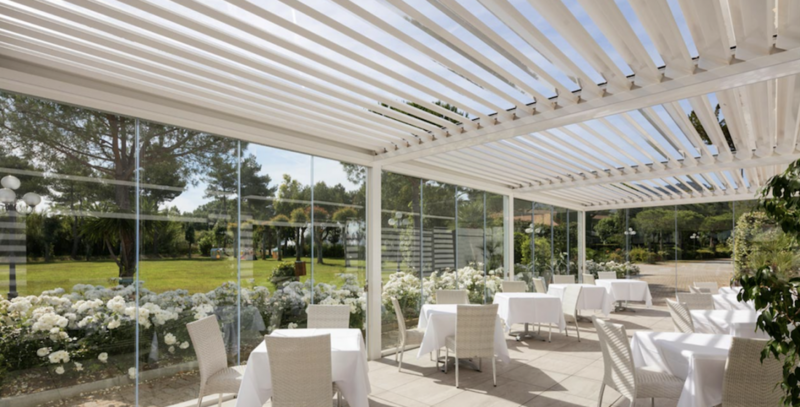 You may wish to have a pergola on your garden terrace at home, or you may be a restaurant or pub owner. 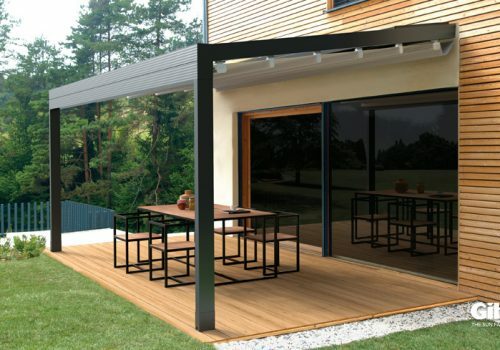 Whether you wish to extend the amount of indoor space outside, increase the number of tables in your restaurant, create a space for people to stand outside and congregate such as an outside smoking area, use as a home gym, home office or seating area for al fresco dining, these contemporary pergolas create a really good atmosphere whilst providing you and/or your guests with shelter and comfort outdoors. 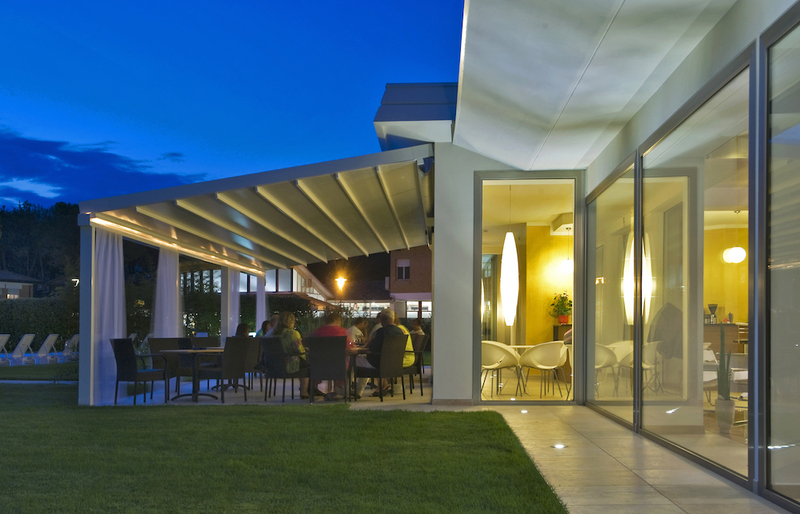 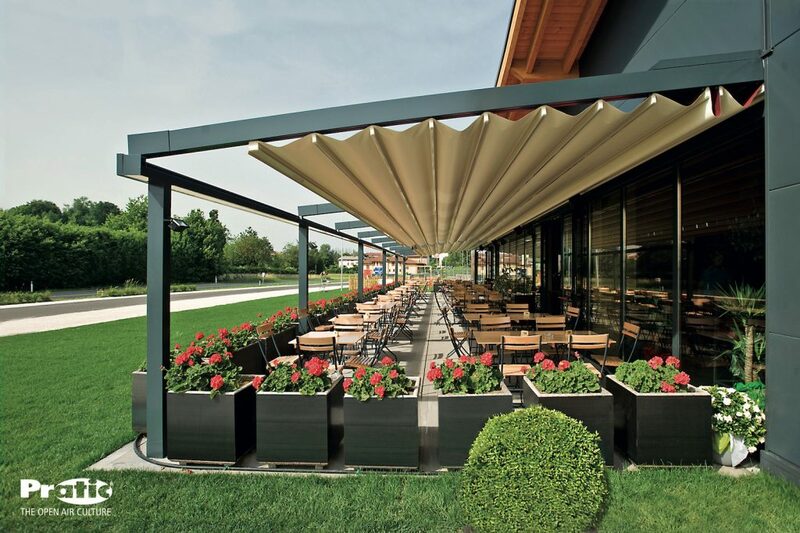 Our Pergolas are ideal for any pub, restaurant, bar or club with an outside area. 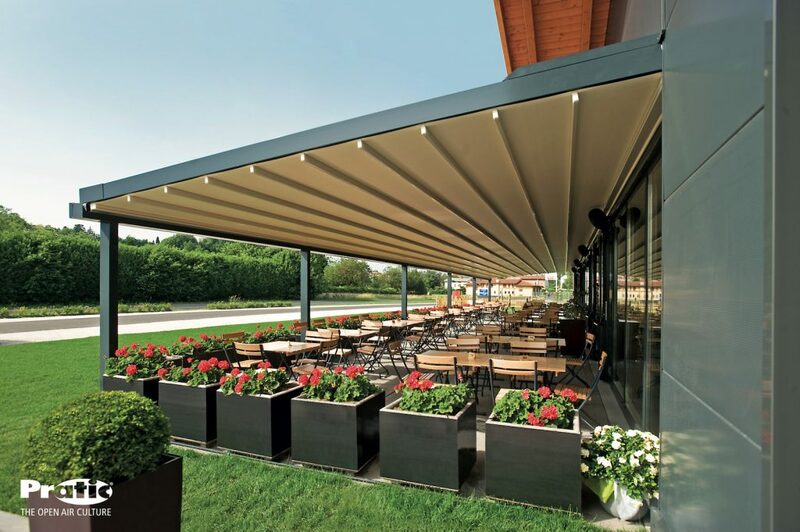 Pergolas have enabled clients in these industries to extend entertainment and dining areas outside in more than just the mildest of weathers, resulting in a larger seating and dining area, larger capacity for clientele and as a result can generate more revenue, on a relatively inexpensive scale. 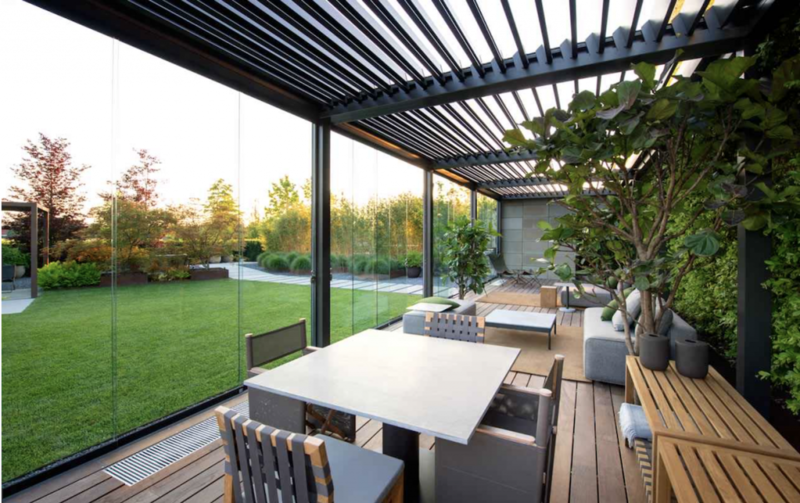 Allow sunlight and warmth in by fully opening the roof! 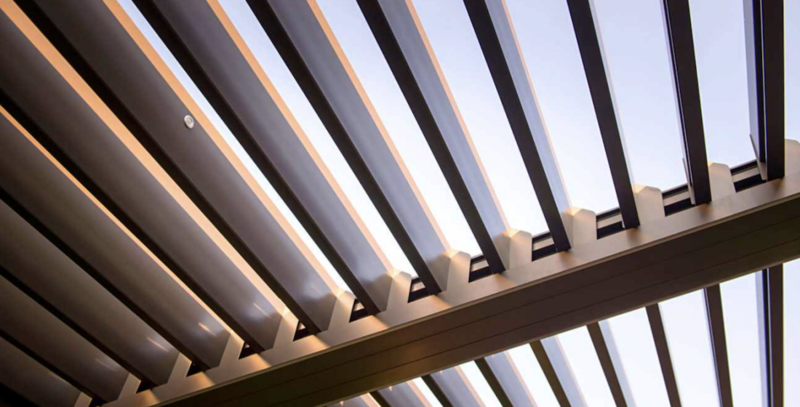 For a free quote and let us show you what we can do for you.